Doc McCoy is a career criminal. After his wife, Carol, manages to bribe the chair of a patrol board and springs him from jail he sets about arranging his next heist with Rudy ‘Piehead’ Torrento. The robbery of the Beacon City Bank goes according to plan, leaving the security guard and their accomplice dead. However, McCoy and Torrento immediately fall out, with the latter shot and left for dead. McCoy and Carol head west, aiming to get to California. Their journey though is full of mishaps. With the cops and a vengeful Torrento on their trail, the question is whether they can escape to Mexico with their loot? The Getaway is considered a classic heist novel and has been adapted for the big screen a couple of times. The premise is straightforward. A gang of four criminals successfully heist a bank then immediately fall out and set upon each other. One is left dead before they have even left the bank. Doc McCoy, the gang mastermind, and Rudy fight and separate not far out of town. McCoy and his wife, Carol, take flight, but her lack of experience and Rudy’s murderous pursuit soon derails their plans. Moreover, despite their continued devotion, a seed of doubt and suspicion has been planted in the mind of each. Thompson keeps the pace high, with plenty of action and twists, while also exploring the evolving relationship between Doc and Carol. The result is an engaging and tense read that delivers both the spills and thrills of a heist and chase and the psychopathology of those involved. The weak spot, however, is the ending which swivels ninety degrees into an entirely different register. It might be literary and allegorical, but felt entirely out of place. Thompson does know how to spin a yarn. 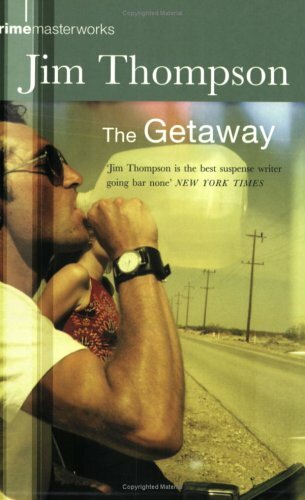 Oddly enuf tho I've seen both film versions of The Getaway I somehow missed the book. Maybe it's time! I enjoyed the ending of The Getaway. I thought it was ironic that the getaway they were looking for was different than they had imagined. That's my take on it anyway.